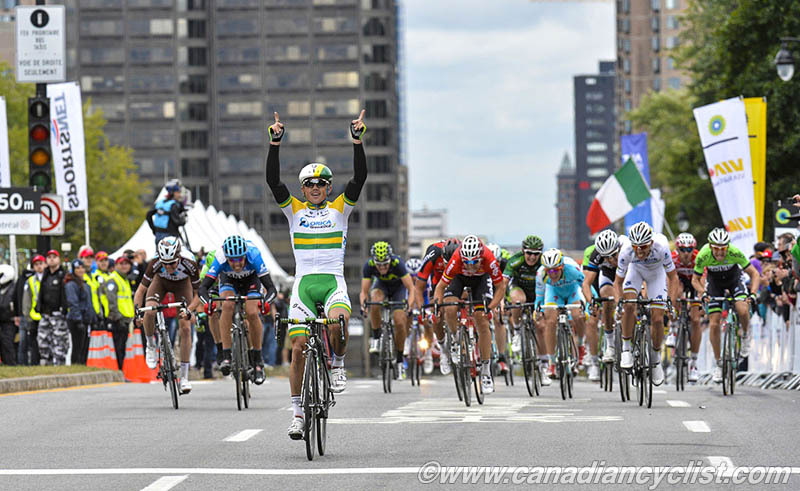 Australian champion Simon Gerrans (Orica GreenEDGE) became the first rider in the five year history of the GP Cycliste WorldTour races in Quebec and Montreal to sweep both events, when he won the Montreal race on Sunday. World champion Rui Costa (Lampre-Merida) was second and Tony Gallopin (Lotto Belisol) third. Mike Woods (Team Canada) was the top Canadian, finishing with the bunch in 26th place. Coming two days after the Quebec race, Montreal did not offer the same beautiful weather as the first event, with riders facing grey skies and temperatures barely out of the single digits Celsius. Montreal is a classic course, with major events running back 40 years, when Eddy Merckx won a world title. He subsequently stated that Montreal was his toughest Worlds. The circuit is dominated by the Mont Royal climb of nearly three kilometres, early in the 12 kilometre lap. The riders immediately descend the other side and head through a series of left and right turns on city streets before a second shorter but steeper climb and a fast descent. The route then curves around the base of Mont Royal before heading down a boulevard past the finish line and making a 180-degree turn for the final 400 metres of slight uphill to the finish line. The riders had to cover 17 laps for a total of 205.7 kilometres. Four riders went away on the first lap; first Arnold Jeannesson (FDJ), Louis Vervaeke (Lotto Belisol) and Jan Polanc (Lampre-Merida), who were then joined by Ryan Roth (Team Canada). At the beginning of the second lap the gap was two minutes, but it quickly zoomed over ten minutes, with the peloton disinclined to chase. As the time gap went into the double digits, the WorldTour teams began to take notice, and started sending riders to the front to bring the break back. However, their efforts were ineffective for the first half of the race, before Astana sent most of their team to the front to work for Enrico Gasparotto. Finally, the break started to come back, as the laps piled up and the break began to tire. Roth was the first to go, with three laps remaining, and he was quickly joined by Jeannesson. Polanc and Vervaeke kept going, with the gap two minutes at two laps to go. Vervaeke took the final KoM points to win that competition then dropped off, leaving Polanc alone at the front. The Lampre rider began the final lap with a lead of about a minute, but was swallowed up on the Mont Royal climb. The attacks began on that climb, with a group of nine going over the top clear, including Gerrans and world champion Costa. However, it was reabsorbed by the quickly shrinking lead group. Costa made another solo effort with three kilometres to go, but Orica GreenEDGE was firmly in control, setting up a train for Gerrans in the final two kilometres. Peter Weening led Gerrans out of the final U-turn and onto the finishing stretch, where Gerrans exploded off his wheel to finish nearly five bike lengths ahead of the bunch. "I couldn't have asked any more of the team again today," Gerrans said. "We set out a plan at the start of the day, everyone followed it perfectly and the race unfolded exactly as we wanted." "To still have four or five teammates there coming into the final was amazing, so I am just really happy to be able to finish off some great teamwork again." Team Canada had two protected riders - Woods and Ryan Anderson, with the rest of the team there to support them. Woods finished with the front group, but came out of the final turn poorly positioned to move up. "I think we got a bigger gap than was expected," commented Roth. "We did our best to hold on, but there's always more guys willing to ride in front in the field, so it puts the break at a disadvantage. The plan was to put someone in the break; we had wanted to do the same thing in Quebec, but we didn't commit as much as we should have, so today we wanted to make sure we had someone in there, and I was the one that made it." "I was definitely struggling on the climbs later in the race and wasn't able to do as much as the other guys. So I was just focussed on staying there [in the break] as long as I could and do my piece to help when I could. But fatigue takes over, and you are just surviving." Note: Roth said that he has signed with a North American team for next year, but cannot say until the announcement is made, probably in another month.